PHUKET: -- Phase two of the project to remove the unsightly cables that have been obscuring the classic Sino-Portuguese shopfronts along the streets of Old Phuket Town for decades continues this Saturday when workers will pull down the power poles along Deebuk Road. The removal of the power poles on Deebuk Road this Saturday follows the removal of overhead power cables and the corresponding power poles on Krabi Road last weekend. The Phuket Provincial Electricity Authority (PEA) completed phase one of the project along Thalang Road in late 2010 and planned to start phase two in March 2011. Although the project suffered delays, the PEA has now finished laying underground cables along Krabi and Deebuk Roads, and has since started partial work on the section of Thepkrasattri Road that passes through the area. The second phase of the project will cost about 39 million baht in total, with PEA putting up 26mn baht and Phuket City Municipality allotting another 13mn baht to see the project finished. 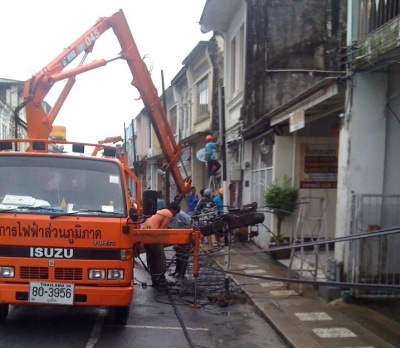 “After the PEA removes all of the power poles, Phuket City Municipality will take care of the road. 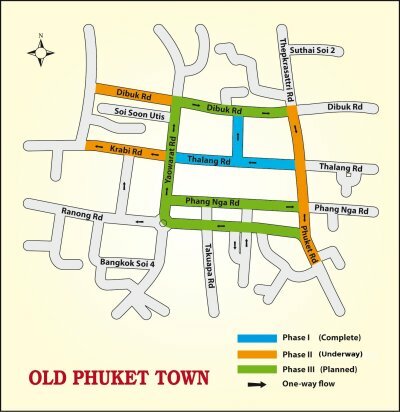 We will repair the road surface back to normal as soon as possible,” said Phuket City Municipality Public Works Division director Kraingsak Chuchartphong told the Phuket Gazette. “The PEA informed us that they will come to remove the power poles on Deebuk road this coming Saturday [May 12]. As soon as the PEA have done with their part, we will go to take care of ours,” he said. Despite nearly everything going to plan so far, the underground section along Thepkrasattri Road has been put on hold while an unforeseen problem is resolved. The problem lies with the concentration of existing telephone cables in that area that feed into the main telephone exchange nearby. “Work on installing the cables underground from the Tua Poh furniture store at the Thaew Nam Intersection to Aram Bridge on Phuket Road is still underway,” said Mr Kraingsak. “It will take a while before we can proceed with installing the electrical cables in that area underground, so to prevent traffic congestion in the meantime we have filled in the road excavation to allow traffic to pass until the telephone cable issue is sorted out,” he said. Reaction to the completion of phase one was generally positive, but locals reported the traffic congestion as “terrible” while the work was underway. Great to see; when are the rest of Thailand's towns and cities going to get the same treatment? Billions of years is a bit harsh. Really it's a good and bad thing. Do you think the quality of the casing of the cable is good enough to stand the test of time? Do you think that they won't want to dig it up and change the cables quickly? Hopefully there is some sort of plan that will slowly gain momentum. You know how down south get "less of the pie" than central Thailand and that they are still developing infrastructure that, if not for tourism, would be even more derelict than it is right now. They could go a long way by just tidying up all the telephone & cable TV cables. The overhead power cables look absolutely beautiful compared to those. Roof tiles - repaint or replace? Visa on Arrival: can you get re-entry permit?